Because the work never stops, we cruise! Above is what happens when a 20,000# boat snags your anchor rode and hangs from it in rough, windy weather. The green is bottom paint, rubbed off their hull, and the slightly hairy, frayed look is, well, frayed. And therefore unsafe. The good news is that at the time we were dragged down on, we had deployed only 25′ of this 200′ line – the rest of it was still down below in the anchor locker. The answer to that frayed spot, therefore, was to do what’s called “End-for-end” the line – use the other end of the line, and keep that weakened area out of the way, down below. So that’s what we did – swapped ends, and started fresh, with a line that’s now only 175′ long, but sound as a silver dollar. Meanwhile, I got to looking at the rode for the secondary anchor, which we hadn’t used in over a year prior to the Anchor-dragging Incident, and decided I didn’t like the look of one end – it had been spliced without a metal thimble, making it much more susceptible to chafe. The solution is to resplice it, using a thimble this time. Above, at top, is the old end, directly spliced to the shackle with nothing to prevent wear of the rope against the shackle. Below that is the start of the new end, with a thimble being included in the eye, protecting the strands of the line. The new end, about half-way done. Fun work, actually! Once the taper is completed, the fuzzy ends of line are burned off with a torch, for a smooth look. When you leave shore and head out, you never really know what’s coming. Most of the time our plans work out pretty close to the way we hope, so I’m not dissing the Universe when I say that curve balls will be thrown and Mother Nature always bats last. My moments of gentle sarcasm are more an acknowledgement that we are not – any of us – nearly as in control of our lives as we’d like to pretend. For our trip from Key West to the Dry Tortugas, we took it easy, three days. It’s only 58 nautical miles (67 miles as the car would drive), so we could have done it straight through in about 12 hours. But that would require really pushing it, since there are only 12 hours of daylight right now, and you do NOT want to arrive in the Dry Tortugas Park in the dark. Since hurricane Irma last fall, the shoals have shifted, and many of the navigational markers which show them are damaged or missing. So we sailed (well, mostly motored due to lack of wind) to Boca Grande Key (no solitude there! Saturday night and it was crawling with testosterone and beer-scented sunscreen) first, then Marquesas Key (blessedly quiet and dark enough to see real stars! ), and finally a 7:30am departure for the final 42 mile jump across open water to the Dry Tortugas. Where the first two days had a distinct lack of wind, the final stage had buckets of it – and from behind, which Sionna abhors. We rocked, we rolled, we waddled, we sashayed west with 20 knots of wind off the starboard quarter and making 5.8 knots average for the trip – a speed record never before approached by our good old boat. We were also exhausted when we arrived 8 hours later. Sionna with the wind behind her is like a round-barreled pony that’s determined to roll in the grass, and only constant vigilance by the helmsman/woman can keep her from it. “Bam!” “SCRAAAAPE…” (I hate that sound). No, more than company. They’ve attached themselves to us, a Remora (otherwise known as a “Sucker Fish”). Another sailboat has dragged their anchor from upwind of us, and a dragging boat drifts sideways to the wind. 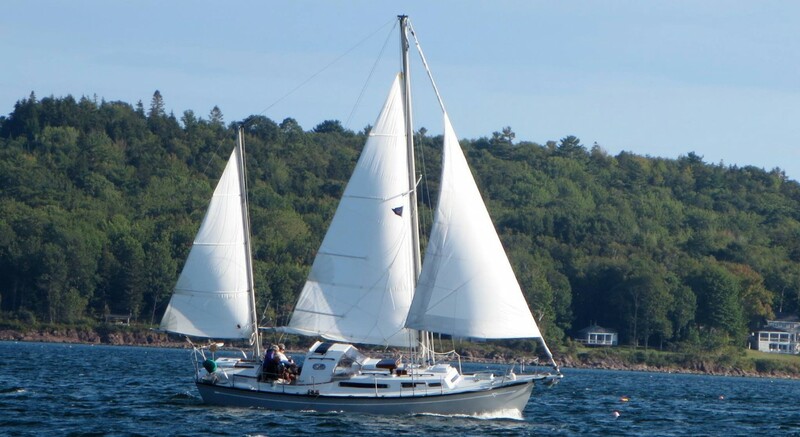 They have “t-boned” us, impacted on Sionna’s bowsprit – her pointiest point – about ⅔ of the way along their length, and their bow has swung alongside, their rudder now firmly held by OUR anchor rode which is caught in the space between their rudder and keel. They have come to rest alongside, and our anchor is now holding both Sionna and 35’ Benetau . For the time, at least, we are holding, and I’m thanking my lucky stars for oversized ground tackle, but how to get them loose? The tension on the anchor rode (¾’ nylon line) is incredible. While Sionna is mostly pointed into the wind, Benetau is hanging at an angle, presenting a huge surface area to the wind and adding her 20,000# weight to the 14,000# of Sionna. No chance of hauling it in slightly by hand to create some slack. So much for plan “A”. The far end of our rode must be freed from where it’s secured below in the anchor locker, and after doing so I gather up our life vests, don mine, and carry Nicki’s to her on deck. The remaining 150’ of ¾” line (we have 25’ of it deployed in the water, along with 75’ of ⅜” chain coupling it to the anchor) must be hauled out from below decks and roughly coiled and bound, then threaded through the stancions and furler lines until it can be tossed from the boat. Now, when we figure out how to uncleat that line against its incredible tension, it should eject overboard without catching on any part of either vessel. Benetau’s inexperienced crew – a middle aged and clearly terrified but courageous woman – finds me a float (an empty Tide bottle), and I tie it to the anchor rode. If it floats, we may get our $1000 worth of gear back. Plan “B”: I ask Nicki to try to power forward, attempting to take the strain off, but our 27 horsepower does nothing – we gain not an inch against the pressure of the wind. Nicki finds my boat knife in the pants I’m not wearing and brings it forward. Time for plan “C”. There is no “D”. I retrieve a length of ½” nylon line while Nicki re-routes the standby anchor’s chain so that once we are (hopefully) free, we’ll have a clear anchor to use. My memory flashes on the knot practice that Nicki and I used to do, sitting in front of the wood stove on a winter evening in Maine, glass of red wine at hand. Which one to use? I need to secure my ½” line to the ¾” nylon rode in such a way that I can lead it to the anchor windlass and pull, thus releasing the strain at the cleat. Only the Rolling Hitch will do – and it’s one of my five “must know” knots and hitches. Hitch applied, line wrapped 3 turns around the drum, Nicki applies pressure to keep the line from slipping (called “tailing” a winch) while I crank. SO stiff, there is SO much pressure on that line, the handle barely moving, but we gain an inch, then another, wait out a gust, gain another 3 inches or so and suddenly nothing – the windlass’s handle has folded in half near the end – useless! But 5 inches is just enough. Nicki holds her tension so we don’t loose that critical five inches, and I uncleat the anchor rode, dump 150’ of line overboard, and touch the edge of my knife to the ½” line a foot from my hitch… “Bang!”, and it’s gone. I watch for the float. Benetau begins to move, scraping and bumping along Sionna’s port rub rail, but I have eyes only for the float. If it appears, Benetau is free and our gear recoverable. If it does not…. Such is my focus, and such is the noise of the wind, that I don’t witness the drama unfolding aft. Benetau has swung to port as she moves, and her bow is now caught against our dinghy, suspended in the davits off our stern. Nicki tells me later that the dinghy swung up and out, lines straining, and she at the helm did the only perfect thing – rudder hard over and full power to kick Sionna’s stern – and the dinghy and solar panels – away from the other boat’s bow. At the same time, I see that beautiful orange Tide bottle pop to the surface on the far side of Benetau, our anchor rode and anchor below, safe for another day’s efforts. We are free. The drama continues, but our part in it is nearly done. We re-anchor with our secondary without issue, and Benetau spends the next hour trying, and trying again, to get an anchor to set. This harbor is on record for having variable holding – some areas are good, and some are not – but poor Benetau can’t seem to catch a break. Finally I raise them on the radio, and nearly order them (though it is his choice, until they are secure WE feel unsafe) to pick up the one and only mooring here. It’s clearly labeled “Gov’t Use”, and sure enough, a ranger immediately comes on the radio to advise that it can only be used in emergencies. I explain the situation, and he subsides into silence in the safety of his brick and mortar office ashore. “Small Craft Warnings” signal flag atop the fort. And so the wind blows. The forecast calls for storm watch conditions to continue for another day-and-a-half, so we are boat-bound. Though it would be lovely to step ashore, a trip in the dinghy in these winds and chop would be both wet and risky, should the outboard motor decide to play hooky. We read, we write, we watch the comings and goings of the seaplanes, ferry, and other vessels, and occasionally we’ve watched other anchors drag with their own unknown dramas. It is good to be secure, but it will be better when the sound of the wind isn’t the biggest presence in our lives.